Monitor Audio Bronze B5 AV review | What Hi-Fi? Hand-me-downs have rarely been so appealing. When Monitor Audio upgraded its Award-winning Bronze home speaker package, it made sense to use technology from the company’s pricier ranges. The B5 AV system comprises the new Bronze Centre, two Bronze FX surround speakers (whose three-faced and easily wall-mountable design means versatility in positioning) and Bronze W10 subwoofer (as do all Bronze packages) and a pair of Bronze 5 floorstanding speakers for front channels. The technology upgrade centres on new C-CAM drivers (made of Ceramic-Coated Aluminium/Magnesium, a material originally developed for jet engine components). For the midrange and bass drivers, the stiffness and damping quality of that dished cone claims to aid control and reduce break-up. The drivers are also an inch smaller in diameter than previous models, helping reduce the speaker’s overall footprint. The tweeter’s C-CAM dome is gold anodised for stiffness and also dampening, meaning that the sound shouldn’t harden at its highest frequencies. We play Taxi Driver on Blu-ray and are immediately struck by the film’s jazz accompaniment. Instruments are brilliantly organised and offered a generous amount of space in which to breathe, but most of all they are expressive and terrifically rhythmic. When Bernard Herrmann’s score is realised like this, it highlights Robert de Niro’s own improvisational delivery, giving purpose to the false starts and broken sentences. The sound dates the film as much as the flared trousers, but the package doesn’t hide behind that. Voices are clear, warm and expressive, there is depth to sounds such as the fizz of Travis’s Alka-Seltzer and real attack to the gunshots. This is a reasonably-priced speaker package, but that doesn’t restrict it from exploring the nuances of a dejected, lonely film. Changing tack with ParaNorman, the Bronze B5 AV is equally comfortable with the scale and intensity of the modern-day family-focused animation. Those same characteristics of rhythm, detail and organisation are present as the zombies chase Norman and co through the woods, only now with a healthy injection of power. The surround sound field is cohesive, and there’s great tonal matching between the channels. They feel comfortably in control, without being restrained, delivering perilous thrill and slapstick humour with consummate ease. Unsurprisingly, the results are much the same in stereo. We play LCD Soundsystem’s Sound Of Silver album and, though still using an A/V receiver and not a stereo amplifier, we remain impressed by the balance, dynamics and expressiveness that keep us hooked. 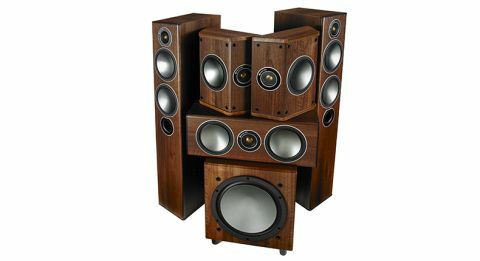 If you’re using these speakers for music as much as cinema, this may be where the depth and organisation of the Bronze 5 speakers trumps the Bronze 2-based alternative package most considerably. You don’t have to be Miss Marple to read the clues – we like this speaker package a lot. Monitor Audio’s decision to hand down driver technology to its Bronze range has raised the standard. This package delivers a sound that is bold and capable of great subtlety and dynamics. Spend a couple of hours with the Bronze B5 AV and this may be the easiest £1500 you’ll ever spend.